Any cameras in the parking lot? Insurance companies LOVE getting footage of the damage being caused by someone other than the insured. Police found the guy; it's going on his insurance. Doesn't really matter, since my deducible on a hit and run turns out to be $0, but satisfying somehow. Good thing it’s getting fixed how it should be. Same damage happened to my wagon so I ordered a door in the same color and in the process of swapping everything over as well as M3 mirrors and roof rack delete. How's the car doing? Looking forward to seeing the M3 mirrors on there. I ordered an M Tech II front bumper for the wagon. 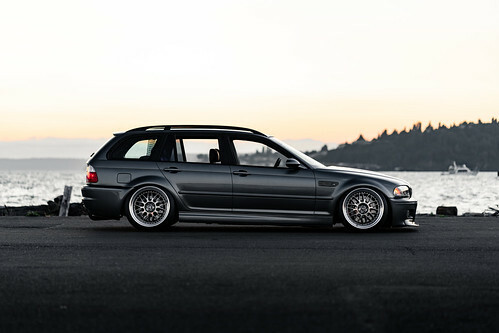 Once I have the 530i assembled and on the road, I intend to DD it for a bit and dig into all these wagon projects. It just rolled over 190,000 miles, so I plan to do a top end refresh on it-- head gasket and new valve guides/seals, as well as a fuel injector rebuild. I'll also switch it from the Beisan prototype chain guide to the Beisan production change guide. I also plan to flash a euro M3 tune onto it, given the Euro M3 headers. I also have the M3 behind bumper ducting and aux fan (Kaiv included it with the car). I haven't previously been able to use it, because of the stock bumper, but the M sport bumper plays nice with it-- so I'll be sticking that on at the same time. My 17" BBS RG-Rs for this car arrived yesterday and are currently getting refinished. 18" RG-Rs are sold. Beyond that, I don't have any further modification plans for this car.... might just change over to being on an upkeep plan. Last edited by Obioban; Fri, Mar-16-2018 at 03:16:26 PM. All times are GMT. The time now is 02:36:36 AM.